Tuesday 24 October saw a flying trade for Charolais bulls with 85 sold, averaging £6,079 (£405 up on the year for two more) and a whopping 19% increase on last year’s clearance rate to 82%. 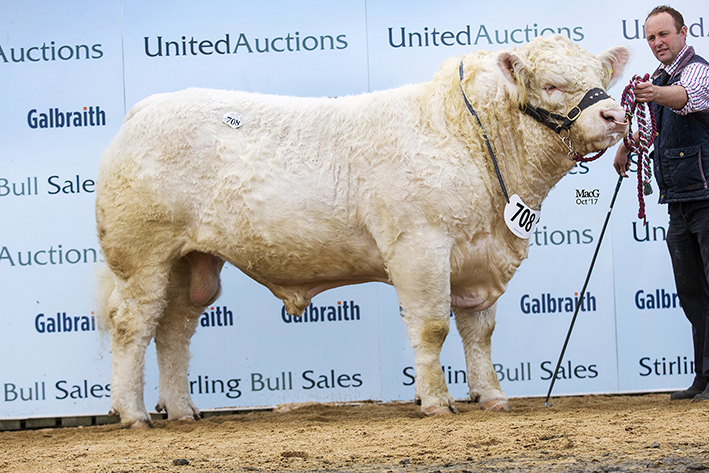 Prices peaked at 12,000gns twice and seven were sold for 10,000gns and above with a further 14 making over 8,000gns. 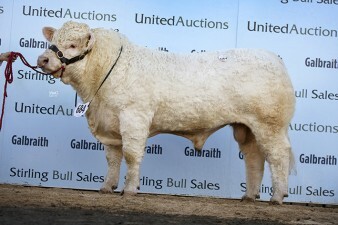 Society chief Peter Phythian commented that “We can attribute the demand for Charolais bulls to the success we are seeing in the suckler and store markets. 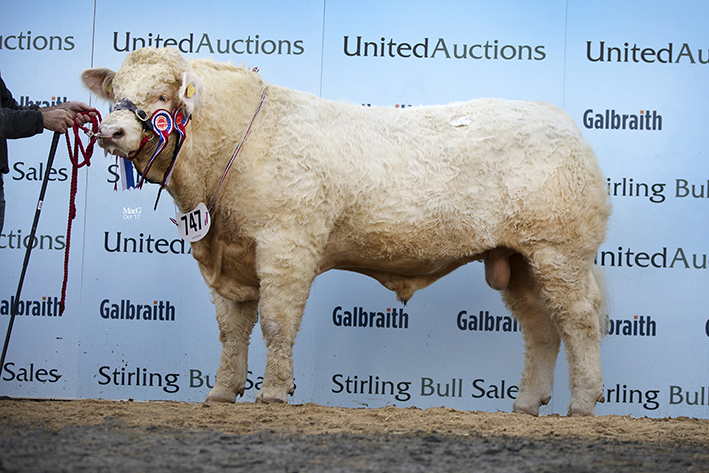 The breed’s focus has been on improving calving ease and this combined with quicker finishing times and higher prices for Charolais sired progeny across the country, has seen both our averages and clearance rates increase at every Society sale this year”. 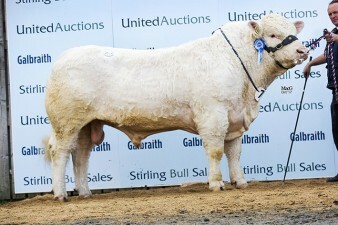 The first of the 12,000gns bulls was an entry from Esmor Evans, Mold, Flintshire. The 17-month-old Maerdy Magestic is sired by the 20,000gns Royal Welsh supreme champion and Highland Show beef breeder continental champion Maerdy Grenadier, and goes back on the home-bred dams side to the French bred Victorieux. His new owners are Colin and Fiona Wight of Biggar, Lanarkshire. 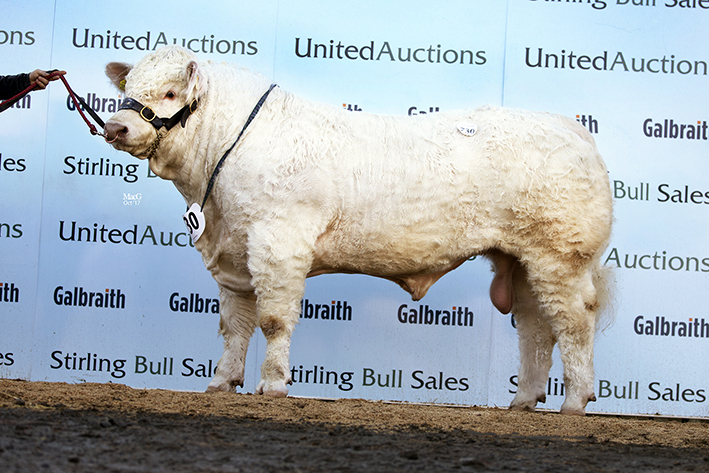 The second to hit the 12,000gns mark was the youngest and final lot of the sale. Sportsmans Monarch who was tapped out first in his class at previous days show, is a son of the 70,000gns Royal Welsh supreme champion, Barnsford Ferny and Sportsmans Honeydew who in turn is sired by 45,000gns Stirling junior champion, Maerdy Express. 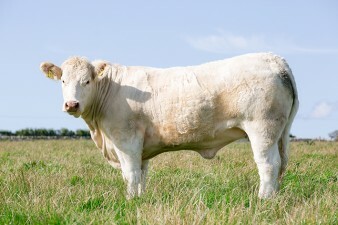 The 15-month-old Monarch was bred and exhibited by Boden and Davies Ltd, Mellor, Cheshire, and heads over the water to work for John McGrath in Dromore, Co Tyrone. This is the first ever stock-bull purchase for John, who has previously served on the BCCS council, is a former Chairman of the Northern Ireland Charolais club and established his Drumconnis Charolais herd in 1993. 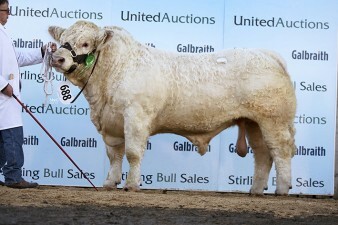 When asked why he was tempted to purchase a bull after using AI for the past 24 years, John said “I was attracted by the character and power of this bull and I feel that his breeding will be a great asset to my herd of 20 breeding females. He has a good top-line, nice definition and I also took his EBV’s into account”. 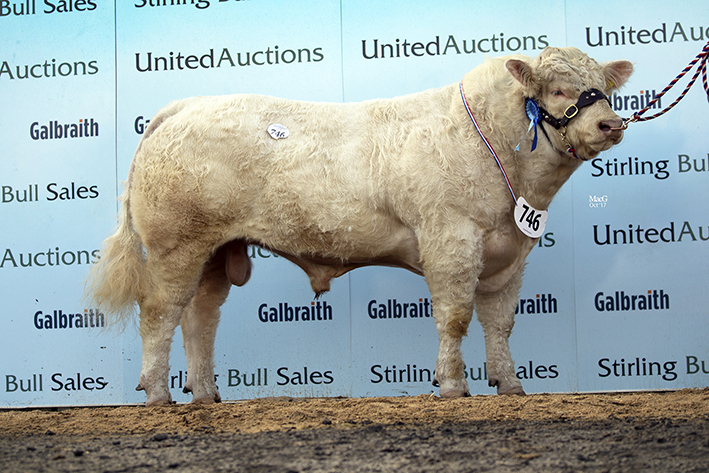 Next in the trade stakes at 11,500gns was a blue ticket winner from WK & P Drysdale, Blairgowrie, Perthshire, who caught the eye of Iain and Dorothy Goldie, Cummertrees, Dumfries-shire. 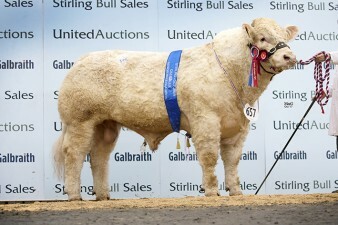 The May-2016-born, 12,000gns Caylers Gladiator sired Glenericht Majestic, is bred out of the Royal Highland Show class winner Glenericht Gem, who goes back to the 16,000gns Stirling junior champion and Caithness show supreme champion, Clyth Diplomat. 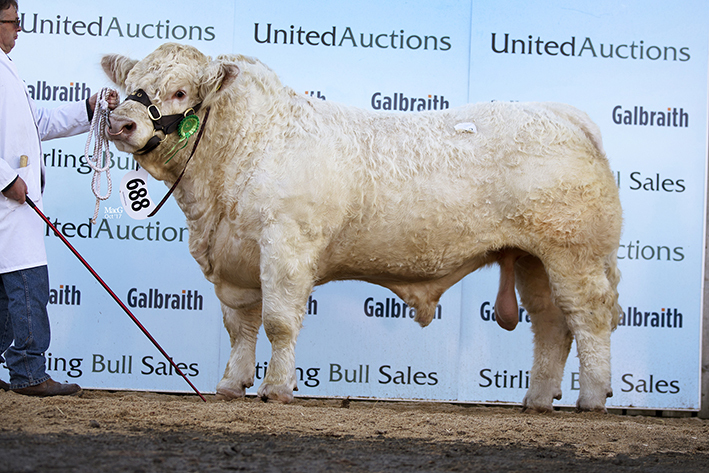 Adding to the Drysdale’s celebrations, they were also awarded the senior championship in the pre-sale show and secured a bid of 8,500gns for the 20-month-old Glenericht Matrix. The breeding here includes sire Highland Show reserve M&S junior beef interbreed champion, Glenericht Hollywood and the 12,000gns Coolnaslee Adversary sired dam, Elrick Fern and he was purchased by Mr A McArthur, Balfron Station, Glasgow. Commanding a 10,500gns bid from Hamish Goldie, Ruthwell, Dumfries-shire, was the Blelack Blackberet sired and April-2016-born Tweeddale Matador. 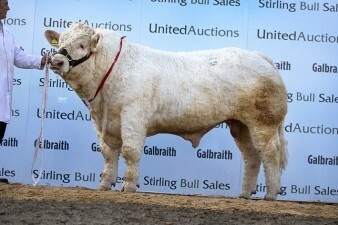 Matador whose dam Tweeddale Icemaiden ET is by the proven high performing, short gestation and easy calving Blelack Digger, was the highest priced offering from Jonathan and Jane Watson, Berwick Upon Tweed, Northumberland, who went on to sell a total of six averaging £6,877.50. The Watson’s next highest priced lot at 9,000gns was Tweeddale Maximum, who had placed second in his class the previous day. Again, born in April 2016 and sired by Blelack Blackberet but this time out of the 30,000gns Dingle Hofmeister daughter Graywood Ebony ET, he heads down to Caynham, Shropshire to work for Evans, Corfield and Son, Ashford Carbonell, Ludlow. 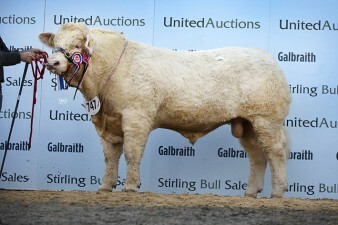 Three bulls then came under the hammer for 10,000gns, with the first being offered by James Jeffrey, Kelso, Roxburghshire. Kersknowe Matador, an 18-month-old son of the 20,000gns Stirling supreme champion and Stars of the Future senior interbreed champion Inverlochy Fencer, out of the Kersknowe Topmodel sired Kersknowe Dido was purchased by Ellis Mutch, Forglen, Banff. 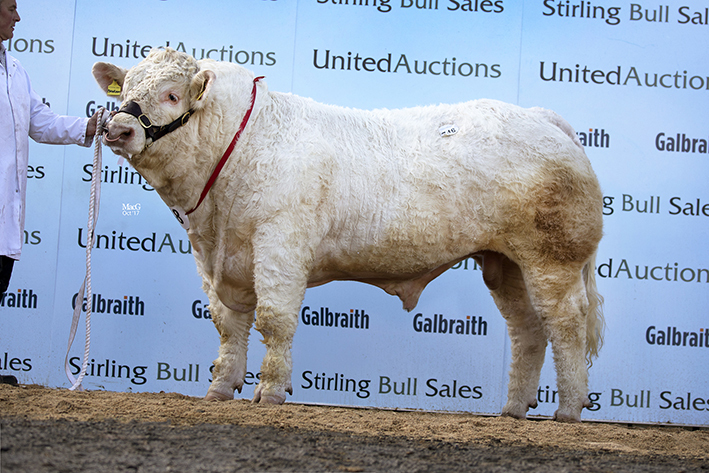 Matching the 10,000gns price-tag and selling to J Irvine and Son, Tomintoul, Banffshire, was the 17-month-old red ticket winner Balthayock Maestro, from David and Nick Walter, Perth, Perthshire, who also sold a total of six which averaged £6,650. 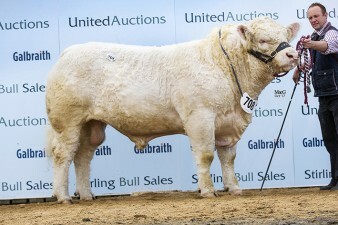 Maestro is the by the 20,000gns Royal Welsh supreme champion and Highland Show beef breeder continental champion Maerdy Grenadier, while the dam is Balthayock Glory ET, a cow by the 26,000gns Balbithan Vespasian. 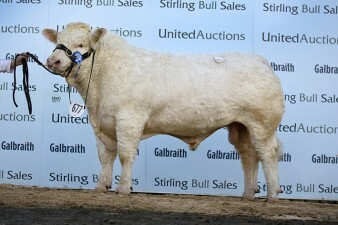 Jack Nicoll Farms Limited, Blairgowrie, Perthshire were the next to offer a 10,000gns bull. The May-2016-born Mornity Mushroom who is sired by the 14,000gns Westcarse Houdini and out of Mornity Icicle who goes back to the 12,000gns Elrick Frenchman, was snapped up by James Anderson and Son, Lauder, Berwickshire. 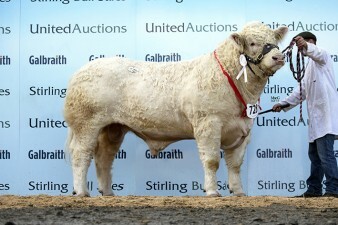 Messrs Millar, Tealing, by Dundee, then went to 9,500gns for another lot from the aforementioned James Jeffrey. The 19-month-old blue ticket holder Kersknowe Matthew is bred from Kersknowe Iceberg, an Inverlochy Fencer daughter and sired by Jurieshouse Hero. The first of two to secure a bid of 9,000gns was the April-2016-born Gretnahouse Macbook from Alasdair Houston, Gretna Green, Dumfries-shire. The sire here is the proven super easy calving and 12,000gns Carlisle reserve senior champion Wesley Equinox, while the dam is the Maerdy Padirac sired Gretnahouse Edwinesse ET and Mr G Mackie, Crieff, Perthshire was the purchaser. 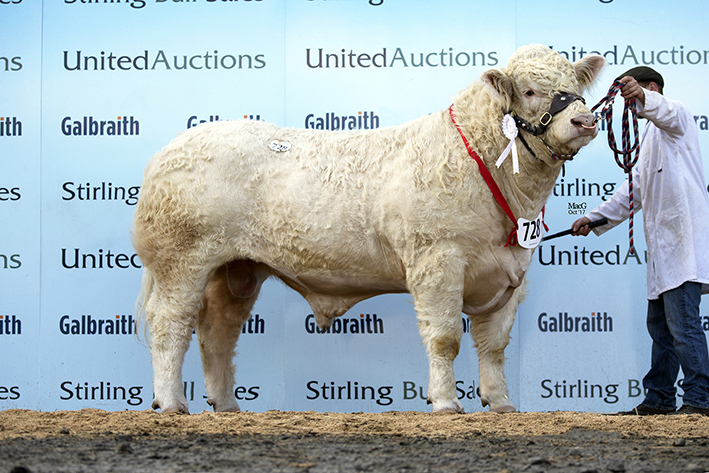 Also bidding to 9,000gns were Mr RJ Brown and Sons, Stenton, East Lothian, this time for son of the 11,000gns Woodpark Elgin and the 12,000gns Perth reserve senior champion Goldies Banker ET daughter, Ugie Halfpenny. 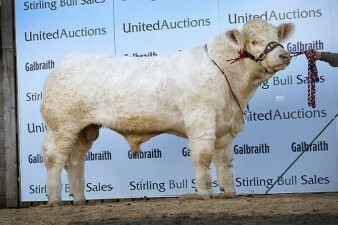 Elgin Mojo who was born in May of last year, was bred and exhibited by Roy Milne & Sons, Elgin, Morayshire. Just behind on 8,500gns was an entry from J Burnett and Sons, Blair Drummond, Stirlingshire. Spittalton Massie ET who was purchased by Mr Mitchell, Tomintoul, Ballindalloch is a 17-month-old by the 31,000gns Carlisle reserve supreme champion Whitecliffe Highlight and out of the 11,000gns Maerdy Dublin sired Elrick Idelle. 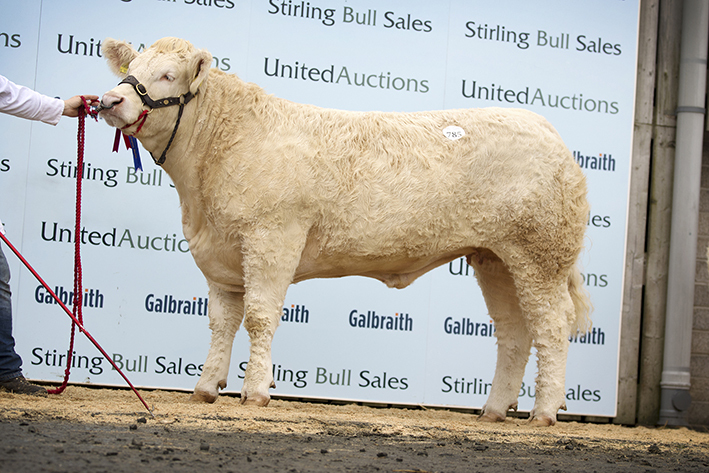 Matching the 8,500gns price tag and this time purchased by Mr Fraser, Ballindalloch, Banffshire, was the Supreme and Junior Champion Elrick Malt from Michael Massie, Ellon, Aberdeenshire. The 16,000gns Stirling supreme champion Thrunton Fearless is the sire of the May-2016-born Malt and his dam Elrick Florida goes back to the 11,000gns Maerdy Dublin. 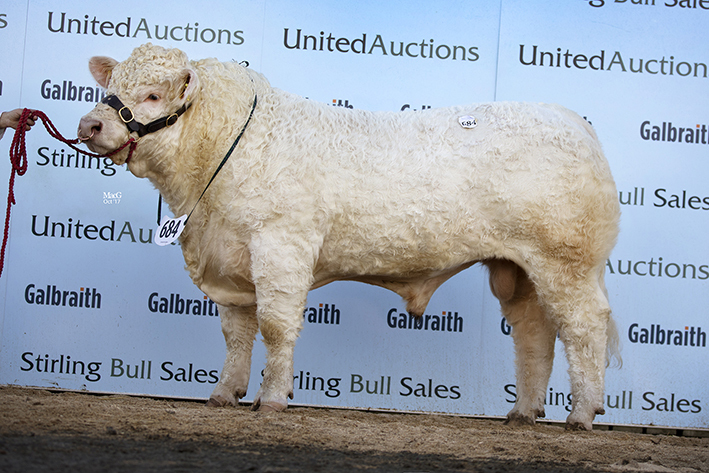 The previous afternoon’s Charolais female sale topped at 5,000gns for the 22-month-old reserve female champion from Hamish Goldie. Goldies Lullaby, who is sired by the 15,000gns Gretnahouse Heman and out of Goldies Bonney who goes back to Thrunton Trademark sold to DP Daniel, Launceston, Cornwall, who went on to purchase three more including another lot from Mr Goldie. Goldies Model ET, a 17-month-old who had been tapped out second in her class in the pre-sale show, is a daughter of the 34,000gns Perth supreme champion Goldies Uppermost ET and the 10,000gns Perth intermediate champion Killadeas Legend sired Goldies Champagne and secured a bid of 3,500gns. JA and MF McMillan, Brechin, Angus were also in the money when their two-year-old, blue-ticket winner Dunesk Lady sold for 3,800gns. The Balthayock Hamish sired Lady is out of the Angus & Fettercairn Shows champion Dunesk Glory, who is herself a Blelack Digger daughter. Lady placed second in her class at the Stars of the Future show in 2015 and sold served by Davally Illusion to R McCulloch, Armadale, West Lothian. Earlier in the day Mr D Sawrij, Galashiels, Selkirkshire had secured the female championship with the two-year-old Swalesmoor Lois, who went on to secure a bid of 3,000gns from RO Williams, Barmouth, Gwymedd. Lois is by the 22,000gns Yorkshire Show male champion Balmyle Headline and out of the home-bred Swalesmoor Iris who goes back to Balmyle Greylag. 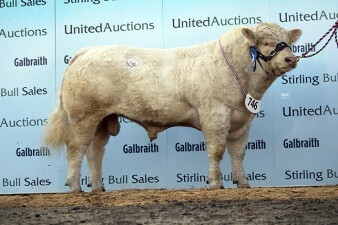 The only cow and calf of the sale, exhibited by the above noted McMillan family sold as a spilt lot for a total of 3,650gns. Dunesk Glory who sells served to Balthayock Hamish, is a Blelack Digger daughter and caught the eye of J Hamilton, Linlithgow, West Lothian. 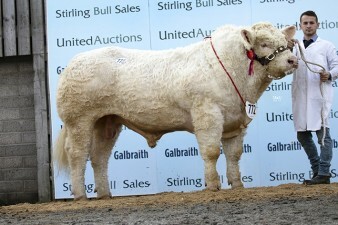 While RF Miller, Braco, Dunblane purchased her eight-month-old, Davally Illusion ET sired calf Dunesk Northstar. 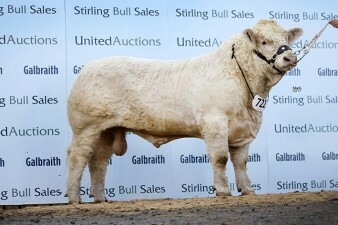 An added feature of the sale was the major reduction of the Baillieston Charolais herd which was founded in the Orkney Islands in 1978 and has grown from the initial purchase of three maiden heifers from the Sway herd, to 60 breeding females today. 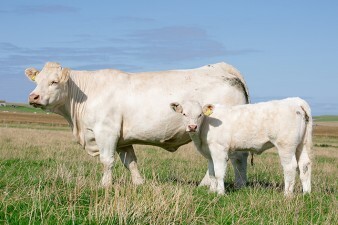 The Baillieston herd was awarded the Harman Charolais Genetick Improvement Award in 2011 and has claimed the supreme championship at the Orkney show no fewer than seven times. 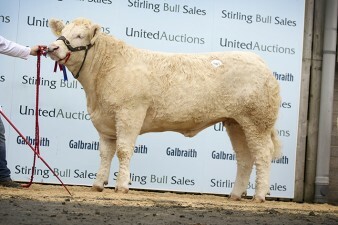 The top price was claimed by a maiden heifer which sold for 4,200gns. The 18-month-old Baillieston Madge who is sired by Blelack Digger and out of a home-bred dam going back to Balthayock Gunfire, was purchased by the aforementioned Boden and Davies Ltd. 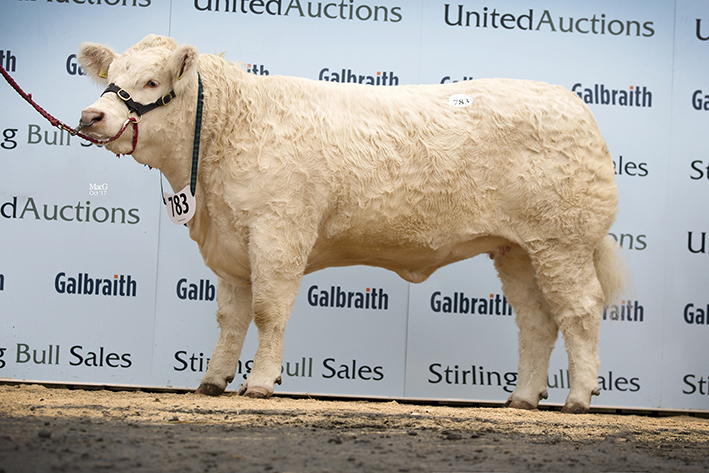 The 14 cow and calf lots peaked at 4,000gns for the three-year-old Baillieston Jill and her April-born son Baillieston Norman who sold to separate homes. 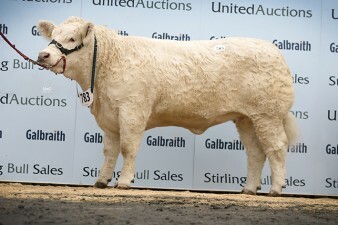 Baillieston Jill is a daughter of Balthayock Gunfire ET and Baillieston Colleen, who in turn is sired by the 17,000gns Mowbraypark Umpire, was purchased by C Mitchell, St Andrews, Fife, while her Blelack Digger-sired son Norman went home with Aldie Farm Partnership, Edderton. 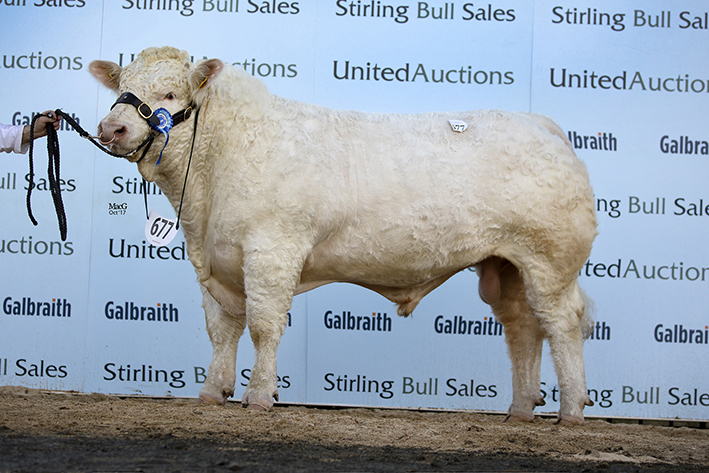 At 3,200gns and going to DA Anderson, Eddleston, Peebles, who bought a total of four was the cow and calf pair, Baillieston Henrietta and her bull calf Baillieston Nevin. The five-year-old Henrietta is by the 15,000gns Maerdy Deiniol and her June-born calf Nevin is another sired by Digger. Close behind at 3,100gns was a mother and daughter pair. 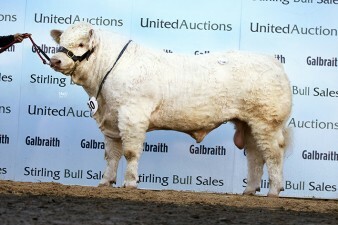 The Maerdy Deiniol-sired and six-year-old Baillieston Gwin and her June-born daughter Baillieston Natasha by the 25,000gns Stirling supreme champion Maerdy Hasse were purchased by RL Riddle and Son, Hexham, Northumberland.